The new year is just around the corner, and you’re revving up to have a fantastic year. You’ve got your teal Inkwell planner and your Prismacolor markers ready to go. You look at the yearly spread inside of your planner and try to figure out how in the world you’re going to reach all of your goals or what to even put in the spaces on the page. There are the general goals: make money and then use said money to buy a new house that you’ve dreamed of since you were in your mid-twenties. Those goals are fantastic and they might be doable if you focus and plan. But you’ll need to be a bit more specific to figure out how to get there. 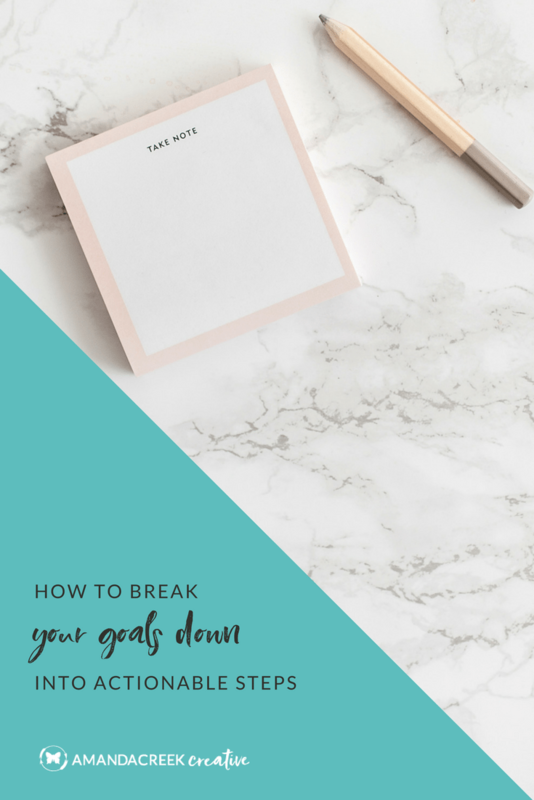 In today’s post, we’re going to focus on how to break down your goals into manageable, actionable steps. By the end, you’ll have more than a general wish and prayer that things will just go well this year. Figure out what you’re going to promote throughout the year. In my business, I like to look at the four to six major promotions that I hope to do throughout the year. I’ve tried to do more than six promotions, and it’s just way too many to keep up with. Four to six seems to be manageable. If you’re a product-based business, you might focus on four to six major holidays or occasions that you’re going to do a major marketing push to sell your products. Think about which holidays or special events apply the most to the products you sell, and write those down instead. The reason you need to start with what you sell is that if you don’t know what things you’re going to promote throughout the year, you’re going to just click about and do a lot of unfocused things that don’t matter much to your goals. After you’ve written out the things that you’d like to promote, you need to plot out when to promote them. I’m not one to like to set things in stone, so I do this tentatively. I don’t make any promises until it’s a bit closer to the actual date because things often get pushed out when life gets in the way. So if I need to push back one promotion by a week, I give myself the flexibility to do just that. This might be a bit more difficult to do if you’re in a product-based business since you can’t change the dates of national holidays. So consider this and perhaps give yourself a buffer week (or two). Now that you’ve written out what you’d like to promote and when you’d want to promote it, you’ll need to start breaking down your projects into actionable steps. I learned how to do this for myself when I used the Get To Work Book’s project planning pages. I don’t use this planner anymore, but I found these pages to be useful in figuring out how to break my projects down into smaller tasks. 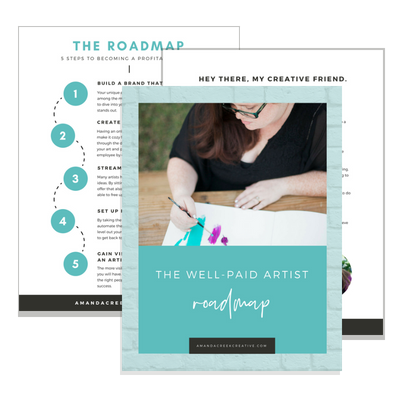 What you’ll want to do is start with the first promotion and write what the promotion is at the top of your paper (or at the top of one of those huge artist sketch pads). Then you’ll want to write whether or not the product or service for this promotion is already created. If it’s something new, you’ll need to consider the time it will take to create this new thing. Honestly, when I’m creating something new, I always underestimate the time it will take to create the thing and also to promote it. So, first write out whether or not you need to create the thing that you’re promoting and then take the time to write out each step that you need to take to make the thing. 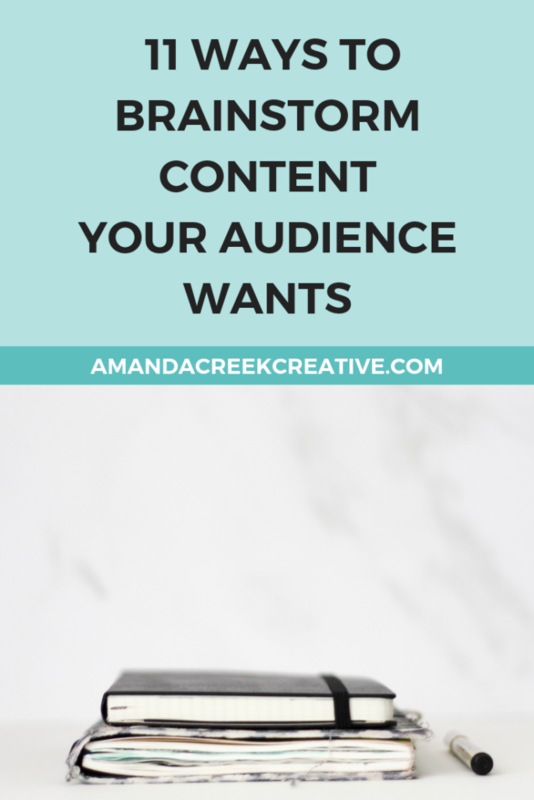 Next, you’ll want to consider how you plan to let your audience/followers know what it is you’re selling. 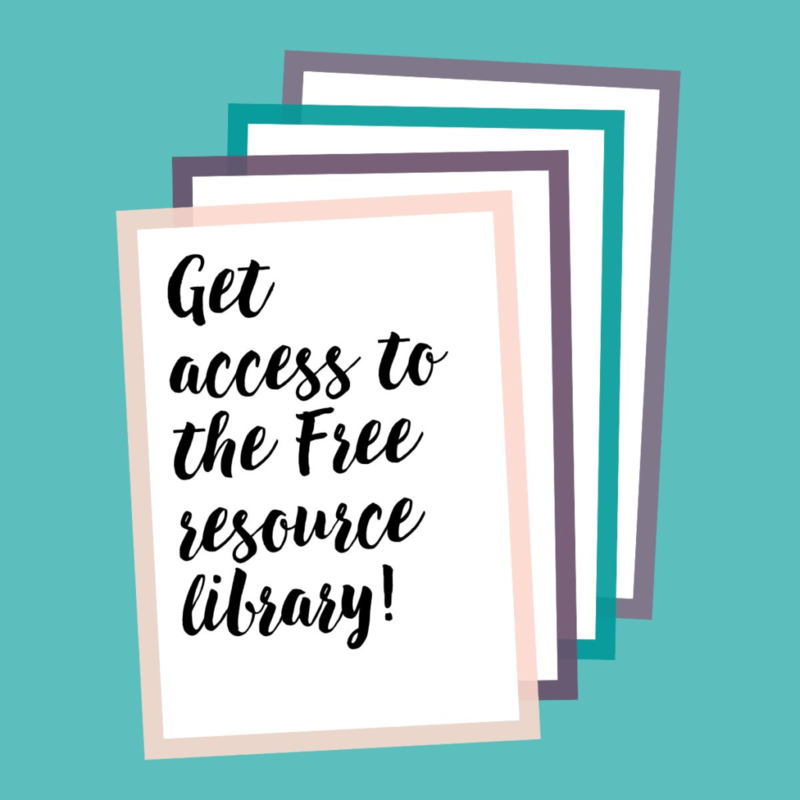 Create a free opt-in incentive that helps prepare people to use your product or service and try to get people on your email list. Once people are on your email list, then you can write sales emails to get people to purchase whatever it is that you’re promoting. No matter what methods you choose to promote your product or service, you’ll need to write out what steps you need to take to get the word out. Finally, you’ll want to repeat this process for the rest of the promotions that you hope to have throughout the year. I don’t plan out every single promotion straight down to the last little detail because I’ve found that I learn new things every time I market a new promotion, or I do a new launch. I’m always learning and adding to my marketing repertoire. Also, to leave room for flexibility, it’s easier for me to just jot in the general time frame for when I’d like to promote and a simple plan for each. Then each month look more closely at what I have coming up next. By having a simple plan, I know that I’m not just flying by the seat of my pants. I’m much more focused; then I can break the tasks down further and keep breaking them down until I have small steps for each day. Having a general plan ahead of time also helps me to get ahead when I have extra time! Do you use any of these steps when you’re planning out your business goals for the year? Is there anything that I left out that you think should be added to this list? Leave a comment below and join in on the conversation! Wishing you an awesome New Year, Bonnie! 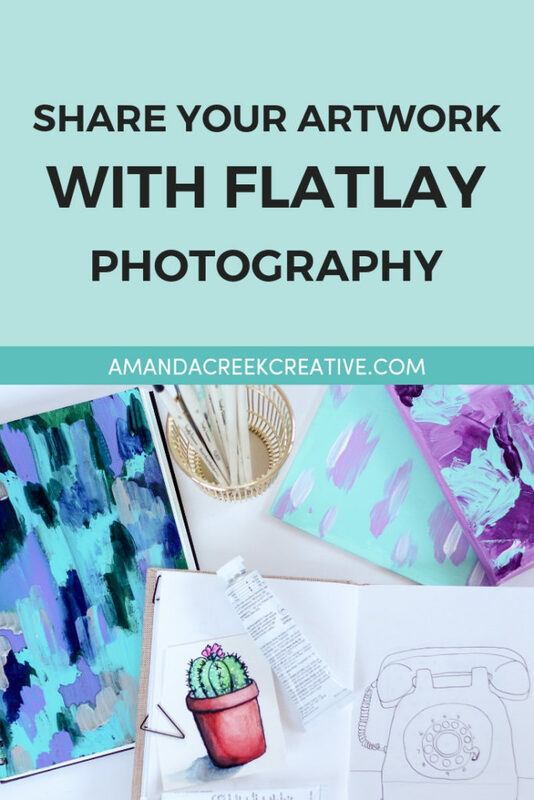 Great blog post, thanks Amanda! Glad you found it helpful, Anke! 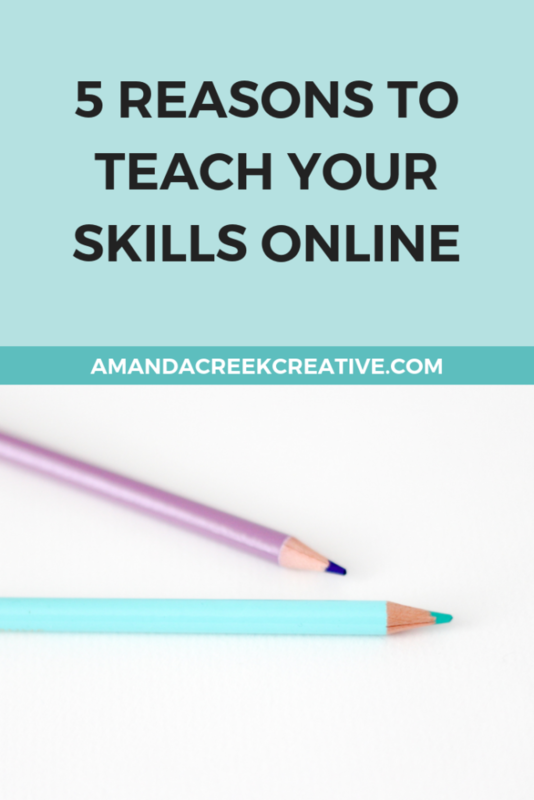 Great post Amanda! For next year I’ll try to concentrate on specific things, I think that should help with being less overwhelmed! Thanks, Carla! I hope it will help! 🙂 Wishing you an awesome and productive 2018. Hey Amanda! I FINALLY got around to reading this post you recommended…awesome! Such good advice and I LOVE “to do” lists, especially when they make sense…took notes in my planner so I can refer back to the steps when I need to…thank you SO much (again)! You’re great at what you do! Thank you so much, Anita! 🙂 I love that you added this to your planner. That makes my day!